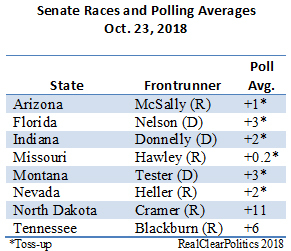 Trump is trying hard to defeat Jon Tester in Montana and pull Dean Heller and Martha McSally across in Nevada and Arizona, respectively. North Dakota appears gone for the Democrats as does Tennessee. 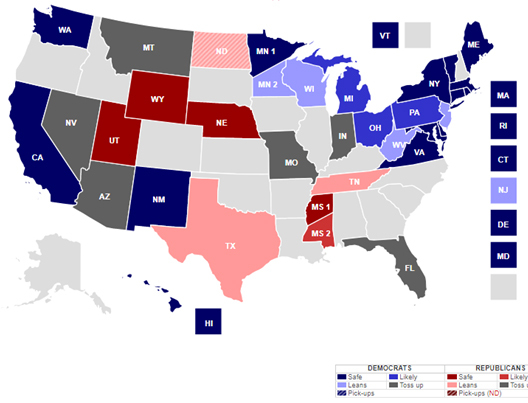 Missouri and Florida are toss-ups, but Democrats are defending incumbents. Hence, if Democrats don’t win Nevada, Arizona and Tennessee and lose North Dakota, they lose a net seat. If Claire McCaskill loses in Missouri, they are down two seats.